When you're ready to install SSMS 2008 be prepared to set aside at least an hour and as many as three depending on the speed of your machine and how current you are on patches and updates. There is are also 1-2 reboots required to complete the install. This walkthrough covers a Developer edition install on a clean Windows XP SP3 configuration that's been patched with all critical updates available at the time on an HP nc8000 laptop. Note: Click on each thumbnail to view a full size image. The first thing you'll get when you run the installer is a warning that the .NET framework needs to be installed along with some other updates. 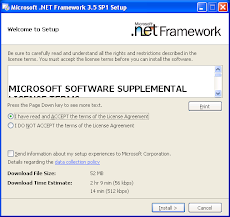 The setup needs to install .NET Framework 3.5 SP1 and wants to download 52 MB of files to do it. The files are actually on the DVD though, so setup moves right along to the installation. Install time: ~15 minutes, no reboot required. 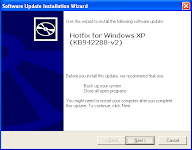 After the .NET Framework I need to install a Hotfix for KB942288 which is really Windows Installer 4.5. No download required. Install time: ~2 minutes, plus a reboot. If you've got Visual Studio 2008 installed you'll also be required to apply VS 2008 SP1....yet another download, install, and reboot. This download is not on the DVD so be prepared to take a coffee break while the download completes. Total install time for VS 2008 SP1 was about an hour on my laptop. Finally after all the prerequisites are taken care of I can get to work on installing Management Studio. SQL 2008 uses an Installation Center with high level tasks on the left and subtasks on the right. Choose Installation on the left, followed by "New SQL Server stand-alone installation or add features to an existing installation" on the right. Enter the product key. The MSDN version I used was pre-populated. Another setup support rules screen which checks more prerequisites. Finally we’re at feature selection. There's now two kinds of installs for Management Tools: Basic, which installs only Management Studio, SQLCMD, and Powershell...and Complete, which adds support for Reporting Services, Analysis Services, and Integration Services plus Profiler and the Database Tuning Advisor. For this post I did a Complete install and Books Online. Review the disk space requirements. Decide whether or not you want to send Microsoft data about how your installation went. Setup then checks to make sure the installation won’t be blocked by anything. I’m thinking this should have been checked earlier; I’d hate to have gotten this far only to be blocked by something else not already accounted for. Now watch the installation progress. Take another coffee break, read your daily blogs, go to lunch...or be prepared to watch this one for a while. Installation wasn’t particularly painful or difficult, just time consuming. Set aside at least an hour or more to do this, and it’s probably best to do it at as an end of day or evening task when you don’t need to use your computer to do anything particularly important or otherwise work-related. Thanks!! Just what I needed! Thanks - I just needed to install SSMS on some client machines and this post came in very handy. Great blog, I just did the installation and then saw the post. No points missed at all. I am not getting all the shred features in the feature selection window. Could you tell me what could be the problem? Thx for this walkthrough, its works ! Any information on installing SSMS 2008 on a Windows 7 machine? Specifically a Windows 7 32 bit install? I keep encountering an OS not supported error. I've installed it on x86 (32-bit). Have you double checked that you're running the x86 installer? Well that was quick. I wasn't expecting such a quick response. Thank you. While the disc does contain x86 and x64 software, I can't see how I could be running anything other than the x86 version. To make sure, I ran the "Landing Page" launcher from the d:\x86 folder. That launches the installer and I'd assume it's the x86 version since it was in the x86 folder. In the Setup Support Rules section the minimum operating system version test is passed successfully. The Setup Support files install correctly too. There is a warning about the Windows firewall, but in the short term, I simply turned the firewall off to pass the test. The problem comes after I select the features. In this case, I'm only selecting the basic management tools. More specifically, the Operating System error says "This SQL Server edition is not supported on this operating system. See SQL Server Books Online for information about supported operating systems for SQL Small Business Server edition". The only thing I can think of is that the Small Business Server edition is somehow different. It's also worth noting that the Program Compatibility assistant does say right at the beginning that "This program has known compatibility issues", although it simply says that I need to apply SQL Server 2008 SP1 before I actually run SQL Server on this version of Windows. Ah, the devil's in the details...SQL Server Small Business edition can only be insalled on Windows Server 2008. See http://www.microsoft.com/sqlserver/2008/en/us/small-business.aspx for more details. If you don't have access to SQL Server Developer edition you may want to consider SQL Express - it's essentially the same basic management tools. Oh dear yes... those devilish details. Thanks for your help Kendal. We simply have the wrong version. I wasn't aware that a separate small business version existed and neither was my OEM supplier. Oddly enough, when he searches for SQL 2008 standard, the small business edition is still the ONLY version that comes up in his channel. Apparently there is more than one class of OEM and his class appears not to be able to sell the true standard version. I doubt we'll be able to return this to Microsoft as it has been opened. I came acroos your blog after doing the install and it looks like I followed each step correctly. Now how do I get my tools connected to a SQL Server instance on our network? I can't seem to find a connection profile or anything. Thanks much. It's always nice to know what to expect. I forgot I had VS 2008 (don't use it much, obviously!) and wasn't prompted to upgrade until after trying to install SSMS. FYI. Hey really nice website, I noticed your website when doing study on some methods to develop my web log. I was simply inquiring which spam software system you use for comments as I get tons on my site. After installing just the management studio, should I install any of the service packs? Do they apply to the management studio on a client workstation, or only to the SQL Server itself? Detailed post, no points missed. Copyright © 2015 Kendal Van Dyke. All rights reserved.